Cuckoo Song is a fascinating and compelling book on several levels. As an adult and mother of a teenage girl, I suppose I interpret and experience it on a different plane from my middle school students. Its plot intertwines with other British fairy legends of the Changeling. The name comes from the habit of the Cuckoo laying her egg in another bird’s nest. The voracious larger offspring takes the food from the other chicks and sometimes pushes them out of the nest. I enjoyed that I had to look up several words and wondered how often the targeted reader would do the same. The most memorable was “zoetrope,” a pre-animation contraption that is a spinning wheel with a sequence of pictures inserted into the slots. When it is spinning, it looks as if the figure is moving. The symbol of scissors is an interesting one. Scissors cut things in a definitive way. Things on one side are right, on the other wrong, no shades of gray. Scissors are a means of destroying the changeling and beings of the fairy realm. Science vs. belief. Some people prefer the cut and dried, the certainty of events to that of chance and change. Sibling rivalry is another theme. There are two daughters in the Crescent family. Penelope or Pen is the younger, dark haired, and always getting in trouble or being blamed for trouble. Triss or Theresa is the fair-haired child, sickly, coddled. Sadly, if she makes friends or likes a governess or maid, they are taken away because her mother needs to feel her total dependence and love. During the story, we see the rivalry between the two sisters, but also the need for approval from the older sister to the younger. The younger sister wants to be loved, but is angry that her older sister gets all the attention. For Pen, better negative attention than no attention. I would categorize the story somewhere between Fantasy and Horror. From the cover, I thought it would be about evil dolls, thinking of characters like Chucky. The cover documents the breaking of a doll that Triss hides at the bottom of a woodpile at their summer cottage. Does this foreshadow the adults’ attempt to kill the changeling by hurling it into the fire? Or the breaking of the child personality and the emergence of the teen? Beyond the excellent symbolism and reflections of English legend, this book is a great adventure as the changeling seeks to rescue her alter-ego from being buried alive and to preserve her own life in the process. I had a hard time putting it down. Tweens can appreciate it for an exciting, weird tale, beyond the symbolism. If you want to search out more symbolic themes, contemplate the young girl Pen seduced by the Architect behind the silver screen in the cinema. Her father is also an architect and is seduced by promises of marvelous building plans and a promise of communication with his dead son, killed in the Great War. What is the symbolism of the Jazz Age? There are references to wild, chaotic jazz versus “dinner jazz,” a tamed version for older adult consumption. There seems to be commentary on mental illness. A doctor who interviews Triss has a book on his desk about the symptoms of Hysteria. In Victorian times, women who stepped out of their place in upper class society might be accused of being hysterical. Triss’s mother seems to me the real hysteric, brittle and often resorting to self-medication with a wine tonic to get through the day. Enjoy the ride and the read! 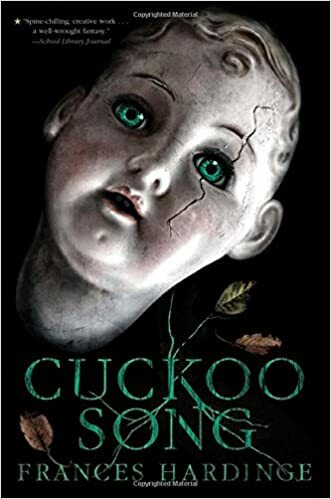 This entry was posted in Tween Literature, Uncategorized and tagged changeling, coming of age, cuckoo, England, fairy, jazz age, kidnapping, scissors, sibling rivalry. Bookmark the permalink.